As fossil fuels are fast depleting in this world, there is a need to preserve these sources and use renewable sources of energy like solar energy wherever needed. This demand has been sufficed by many especially those in developing countries. The cost-effective and light weight solar collectors are one of the many solar run devices that are being currently used worldwide. The Heat Pump Laboratory too has solar collectors where different experiments are going on. The Solar Aluminium Tubular Air Heater is an integral part of the research work going on. It has been developed by introducing important modifications on the previous model of the same but with 5m2 area. The main purpose behind these modifications and developments is to get a cost-efficient system in terms of low cost and weight, and high efficiency delivering optimum usable energy. Project report is attached at the end of the document. 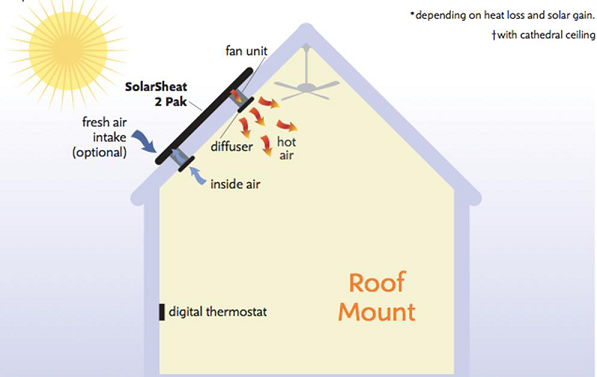 The concerned solar collector aims to impart efficiency of around 75% with temperatures attainable up to 120oC. This can be used for drying agro-products and for other drying/heating purposes. The objective is to find pressure drop which has to be minimum so that it accounts for minimum losses and hence being more cost efficient. Low weight, reduced material loss and high efficiency are the desired outcomes for which the model has to be worked out. The pressure drop as obtained from the previous model has been compared with the current one and calculations are double-checked through MathCad. Relevant literatures on solar collectors are studied and the information gathered from the Literatures was used for testing of the different types of models of systems. This is done with the help of pressure calculations. Using Pressure drop formula for laminar and turbulent flows in calculating pressure drop across collector, with the help of MathCad and finding flow rate through blower fans attached. The pressure is calculated by using simple Darcy’s formula depending upon the Reynold’s number, deciding the nature of flow of air. Along with the pressure losses due to friction, major losses like sudden expansion, entry or exit losses too have been noted whether to be taken in consideration or not. Hence, we get a reduced value of 17.48 mm_H2O pressure drop across the collector. The MathCad 14 software has been used to calculate the pressure drops across any two points in the model. This software tool is a standard for engineering calculation and communication. It has various applications like performing, documenting, and sharing all the calculations and design work. Mathcad's visual format and scratchpad interface integrate standard mathematical notation, text, and graphs in a single worksheet - making it ideal for knowledge capture, calculation reuse, and engineering collaboration. Mathcad also allows to design and document engineering work with unit-aware calculations. Solar energy is one thing that has continued to remain an intrigued topic since days of yore. Tapping this potential isn't easy unless science helps one. Using heat and transfer and fluid mechanics concepts, we explore to find the desired outcome model. The conventional sources of energy fuels like coal are fast depleting and this conjures for a non-conventional source of energy like solar energy. The idea projected here to prepare the collector is to ensure the cost-efficiency of the system which implies low cost and weight model that can save energy and provide optimum usable energy . The solar collector works on the basic principle of conversion of solar energy into thermal energy in terms of heating ambient air which can be used for drying agro-products; wood in timber processing; paper industry and detergent powder industry, room heating in cold regions, cloth drying in laundries etc. The current solar aluminium tubular air heater uses modifications of the previous one having 5m2 area. The differences between these models have been discussed further which add to the better performance of the collector. A low cost and weight but high efficiency built Solar Aluminium Tubular Air Heater, SATAH, is developed at the Heat Pump Laboratory at IIT Bombay, HPL_IITB. This roof solar collector can be used for various applications like agro produce drying, drying of wood in timber processing; paper in paper and pulp industry and detergent powder industry, room heating in cold regions, cloth drying in laundries et cetera. It may also be used in pasteurizing, bleaching, dying and pickling. Developed collector has demonstrated ability to delivering 6 h 30 minutes average temperature of over 120oC for low average insolation of 1000W on the collector plane. Ambient air flows at the rate of about 46.6lps, which results in 6 h 30 min average collector efficiency of 76%. Pressure drop through the collector is 171.47 Pa inclusive of minor losses like sudden expansion on the present collector. As compared to the previous solar collector model, this one proves to be better than that in terms of cost-effectiveness, efficiency and low pressure drops. Whilst the previous model calculations neglected the minor losses, the pressure drop would have been more than 172 Pa. Hence, the current solar collector resulted into a more compact, light weight solar collector with much lesser pressure drop and hence better cost-effective system. As non-renewable sources are depleting fast or demands for alternate sources of energy i.e. solar energy are slowly mushrooming up, there is nothing to defy the fact that solar energy holds great potential in future as well as in present scenario to conserve energy and convert it into usable form. The solar collector so mentioned holds great potential to serve its purpose for drying with economic benefits. Hence, future awaits for technology blending with solar energy and giving much more innovative and cost-effective solar collectors.